Love us or hate us, we can't ignore you. So, good or bad, let us know what you think about the website. To sign our guest book, to e-mail. I lived in Sherbourne, attended school in Barford and went to All Saints Church at .Sherbourne. My Grandparents were Amos and Emma Wilks. I keep in touch with Kathleen Lambert (Webster). my cousin. It was Kathleen who told me of your wonderful website. I am delighted to have my name in your Guest Book. This is a great web site. My grandfather George Barford lived in St. Albans and London, and his father George was from Birmingham. They made brass instruments for Boosey & Co. and later for Salvation Army, then moved in the early 1900s to Marion, Ohio. 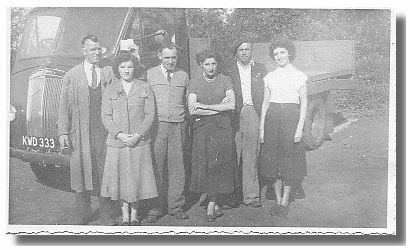 I have just been onto your website after my mum Angela Webb (nee Holton/Jarrett) found some old print outs of a part of the website showing my Grandad (Bob Holton not Holden) with others enjoying a pint in Wasperton. He worked on Mr Johns Farm for many years before moving to Barford in 1968 with my Gran (Rene Holton) and four children (Angela Holton, Phillip Holton, Lynne Holton and Carol Holton). Also my Nan (Winifred Jarrett) and Grandpa (Stuart Jarrett) also lived in Wasperton from approx 1966 with my dad (Peter Jarrett) before they moved to Gloucestershire in 1984 where we are all now. Unfortunately my Grandad passed away in 2006, followed by my grandpa in 2007 and then my Gran in 2008. My nan is still in Gloucestershire not far from where i live now. I have visited Barford many times to see my gran and grandad whilst growing up and always enjoyed spending time there down at the playing fields or going to the shop with Gran to get some sweets, and then taking my own son to visit. My dad has also taken me down to where they used to live in Wasperton and showed me the area and told me his memories of the place. I know my mum has lots of wonderful memories of both Wasperton and Barford as I have heard alot of stories from her over the years, like Stuart MacDonald's mother who was my mum's godmother patching her up on quite a few occasions when my gran panicked, and also most of the locals used to give the children a few coppers for crisps and pop. I know mum has a lot more to say but does not have access to computer so if anyone wants to get in touch with her please let me know. My name is Michael Ryles. I was born in Barford 7th June 1963 and my father still lives there. I was wondering if there is any possibility of finding old school friends from my time at Barford St Peter's primary school from 1968 till 1974. I am also looking to locate old friends from Aylesford School where I attended 1974 till 1979. I still have a lot of friends in Barford and know a lot of people. I'm currently living and working in Poland with my Fiance. Best of wishes to BARFORD and its people. I have many happy memories of the village. Came across your site. Very informative. I often pass your village on my routes as a coach driver. I live in Croughton South Northamptonshire and share my name with your village. I came across the Barford Community Website as I�m moving to Barford Thursday 3rd April. I�m moving to ***, we have had the new house for a week but we have been sorting out the paperwork and getting carpet and blinds up. I discovered the website while trying to find the name of the church in Barford Parish where a couple of my ancestors were baptized. Mr. Roberts kindly answered my question the very same day I sent the e-mail. The site was so easy to navigate, even for the technologically challenged, and it presented such a positive impression of the village and its residents. I especially enjoyed the picture gallery with scenes of the church, village, and beautiful countryside. When I read about all of the fun community activities, I wanted to move there myself. You can be proud of both the website and your village. I would have preferred to send you a "real" greetings card but the print shop is late as usual. Consequently, it is by way of the 'net that we send you our greetings from St Martin for the Festive Season. You are welcome to share our message and card with the residents of Barford and the readers of your community website. We would have loved to have been able to spend Christmas in the village that we speak about every day but will have to content ourselves with drinking a toast to you! I have just found your website and would like to congratulate you on it. I now live in Wokingham, but grew up in Verdon Place, Barford and have many fond memories of the village. I left at 18 when my parents moved to Coventry and didn't return until 2005 when my mother died (my father having died several years before) and we decided to have the post funeral 'do' at the Glebe Hotel. we always felt Barford to be our family home and she would have loved that. Sadly we only had a short time to go round the village and look at our old home, but it seemed very much unchanged. It was lovely, though, to find your website and realise that the love and care of the village is still very much alive. Well done all of you. Many thanks for making our day out on Saturday 25th August a superb day. We travel from Leicestershire to your Scarecrow festival and enjoyed the day very much. We were welcomed in the church with a much needed cup of coffee, had lunch at the scout hut and then tea and cakes back at the church. Our only comment is that we wished you had put the scarecrow�s in number order so we would have known if we had missed one. In our village we have to pay �2.00 to enter a scarecrow and we have to name it, we are then given a number (which all look the same) to display on our scarecrow, people who come to have a look have to buy a programme for �1.50 if they want to, and then judge for the peoples� choice. The winner of this gets �50.00. We then have prizes for Technical Merit, Most Humorous, Good use of materials, set/design/ use of props and most topical. These are sponsored by different firms and the winners get �25.00 each. The sponsor do the judging on them as well. We do have runners up prizes of �10.00 each sponsored by Heather Scarecrow Festival. You did very well with getting so many people to take part and now that the villagers know what it is about you will find more villagers take part next year. We look forward to seeing you again next year. Very well done and we loved your village everyone we found to be very friendly. I have been looking at the Barford Website for some time now and it is still as interesting now as it was then. I have family who live in Barford, Sandy Way, I am married to their son. I am extremely proud and happy to say we are expecting our first child together in a few months and cannot wait. We live in Cumbria and come to Barford as often as we are able. Keep up the fabulous work on your website I like to keep looking at the website when we are not able to visit Barford. I have just found your website it is very interesting. My family lived in Wasperton and Barford for many years, I myself live in East Yorkshire now with my husband and daughter, my parents now live in San Pedro Del Pinatar in Spain as does my elder sister. My younger sister sadly passed away in 1996. I have very fond memories of living in Sandy Way with my son whilst he was growing up, he now lives in Chester with his family. Myself and my son both attended Barford School, Mr Twigger was the Headmatser when I went there, many years ago now. My Father worked for many years at Hemmings Mill, a housing estate now. Once again a truly great site. This is my first visit to your website and I must say I am very impressed. Great website! Enjoyed reading what is happening in Sherbourne!! I was so thrilled to discover your excellent website and very surprised to find my own photograph on the guestbook page. I used to work in the offices of Oldhams Transport before marrying and coming to New Zealand in 1958. Having spent the first 21 years of my life in Barford and still having family there it will always be home to me. Very nice Website. I have connection in Barford. My nieces Claire and Emma Bissell and nephew Robert Bissell live there with their father Mark. I also knew the Reed family Moss, Norman and the others. Enjoyed finding your site and what an interesting village Barford is. Brilliant site, a pleasure to read, keep up the good and very interesting work. In view of all the superlatives used to describe this excellent aspect of the web, it is difficult to find anything to add - or even an excuse for not happening upon it sooner. I will certainly advertise its address overseas and please be assured that I will keep you informed of any dramatic incidents at the Joseph Arch (pub) - assuming that is, that someone tells me. As an ex Wellesbourne and Alveston resident I really enjoyed my "walk" down several memory lanes. I spent almost 16 years as a member of Wellesbourne & District Lions Club so I know Barford quite well. In my day, it was a toss-up who would play Father Christmas, David Field or me. David usually won as he knew everyone in Barford. I still miss "splat-the-rat" at the Barford Fete, we made many a pound note or was it a coin for charity, but the best bit was, to see the smiles on the childrens' faces when they actually got the rat. Please keep up the good work even from Farmington Connecticut it's nice to pop back for a chat. I found your excellent site when looking for one of my ancestors (Sophia Hales) who claimed to have come from Barford. Reading through the reminiscences brought back many memories. I did not live in Barford myself but in Warwick in a flat over 62 Market Place. I passed the 11 plus and went to Leamington College for Girls where I made friends with Beryl Laws from Barford. In summer time we used to cycle along the near deserted country road between Warwick and Barford and meet up at a little bridge to ride back to Warwick or Barford. One day my mother had bought me a dress from the Beehive shop in the Market Place. I rode off proudly to show Beryl my finery and met her coming towards me in the same dress!!! Thank you for creating this great site. My partner and daughter are planning on moving to Barford in the next few months after the sale of our house. Your website has really shown a friendly view of Barford and we can’t wait for all the housey things to go through. Would be nice if someone bought the shop though and convenient. We love the place so much we have visited the Granville for a wonderful lunch every weekend for the last two months. Here we are, 2004 is almost over, I would like to take this opportunity to wish all three villages A Very Merry Christmas & a Happy new year. The three attachments are in my Brother Duncan's album, Note the picture with Ruth in it, the truck had the box removed & was hauling bricks, this was due to foot & mouth. 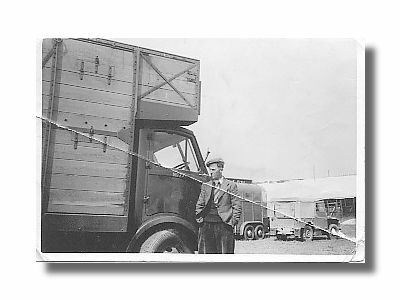 The gentleman standing beside the truck is Mr Bill Shepherd, I think he worked for Jack Canning after working at Oldham's. 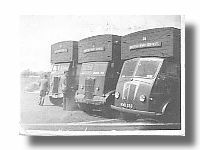 The picture of the three trucks, the one in the middle is a Thorneycroft & a very hard vehicle to drive. Click on a photo above for a larger picture, which will display in a separate window. I was so overjoyed to find this website - what a trip down memory lane, recalling some very happy memories of the time I spent in Barford. I lived and went to school between 1950-1955 I was about 11 years old at the time. I remember Mr. Twigger and Mrs. Calvert - who unfortunately made me very nervous!!! My Mum was a member of the Womens Institute and at that time the squire of the village was getting married and lots were drawn at the WI to see who should be a guest at the wedding in London and among the guests was Princess Margaret. Well my Mum won and that was a memorable occasion for her and my Dad to attend the wedding. My Dad was the foreman at Oldhams during that time which I think eventually was taken over by the British Road Services. When I was a schoolgirl I stayed in Sherbourne village for a few months in 1950 prior to moving to Barford. We actually lived in a beautiful forest like setting in a caravan. That is my Mum and Dad (Frank and Lucy Nuttall) and my brother Ron of course, can`t leave him out even though he used to tease the life out of me!! My most vivid memory of staying in Sherbourne was attending Sherbourne church. I hope my memory serves me right, I`m sure Canon Easterbrook was in attendance then. I`m afraid at that time the church was not very well attended, but when the four of us came through the church doors, Canon Easterbrook`s face would light up. Obviously he was pleased to see us but my Dad suspected he was also pleased to see us as we gave such a boost to his congregation - four parishioners all at once!! What a beautiful church that was and I`m sure still is, quite magnificant tucked away in the small village of Sherbourne. I am sure the Sherbourne residents are quite proud to have such a beautiful church in their midst. Just a short note to say that Ray & I are leaving Barford and at the end of the year moving to Andalucia, Spain. We will be popping back though to see old friends over the next few months, whilst we temporarily move to Sutton Coldfield. We have had a wonderful time in Barford over the last eight years and will miss it. We have made many good friends in the Village. We will of course check the web site and keep up with the village news as often as we can. After a "Google" search to help a genealogist in USA, I came across your site and had great pleasure passing on details. However, as an added bonus I found the site to be immensely interesting myself and have put it securely into my "favourites" folder. If only other communities followed your excellent example. GREAT WORK. Congratulations on a very good community site. Keep up the good work; the site is terrific and a thoroughly good read. This site is very interesting as my gran and grandpa and my granny lived in Barford. My mum grew up in Barford with her brother and three sisters. My gran and grandpa are buried in the graveyard at the back of the church; their surname was Bromley. I myself lived there when I was a baby. Brings back some memories. I am now 37. I was wondering if you know of any bands that played at the hall back in 1965 about May June time, late Spring early Summer, this would be a great help. I would like to take this opportunity to wish all the wonderful people of Barford and Sherbourne a very Merry Christmas and a Happy new year. A special wish to Dear Wasperton, the Village that our family lived in from late 1944 until 1956. Attach is a photo of how you had to drink your beer in Wasperton in that time. From left to right Mr Bill Neal, Stu MacDonald, Mr Ward, Mr Bob Holden. I think the last person is Mr Symington. Editor, you and your staff are doing a excellent job. Keep up the good work. I have become a regular reader of your site. At first I thought I would be quickly disappointed by your monthly only updates as I like to visit 2 or three times a month. For the moment I am still finding plenty to read, thanks to your very user-friendly site map. It is touching to see names I recognise, messages and articles sent to you from many corners of the world. On my recent visits to Barford, after some 25 years of absence, to my ailing father in 2001 and then to bid him "Adieu" in 2002, I was surprised to find only the parents of my childhood schoolfriends still present. Since then I have discovered that a number of you are still in Barford though life has indeed led many to leave, often to far away places (such is my case too). I was of course delighted to see the aerial photos. I have printed the one showing your magnificent cedar tree and my grandfather's house vaguely identifiable just two or three doors along from the grocery shop, and also the one of Dugard Place where one can see my father's last earthly home on Wasperton Lane (My childlhood home was a little further along the lane). It was nice to see the site of Barford here in Finland. Nice website. Very well laid out and informative. Great work. Having lived in Barford for nearly twenty happy years, very sadly my wife & I had to move to Warwick. ...the most marvellous, informative village website. I've spent so many hours poking into the nooks and crannys of the website, I feel I know more about (Barford) than my own home town. It was my brother Stuart who found your site and E-mailing the information on to me. Many of the names are more than familiar as we too went to Barford School in the thirties and forties. I would like to point out that it is a pity that the photographs were rather on the dark side but other wise it is an excellent website. Brilliant Community Web Site _ well done you have obviously put a lot of hard work into this. I also have a local history website; hopefully your site will give me more ideas. I found your website in a search, and it is very interesting to me. My Dad brought my brother Mike and I to visit Barford on the Avon in 1968 (I was a teen), and we enjoyed the visit. My Grandfather George grew up in St. Albans and London. He was a trumpeter and instrument maker, from a Roman Catholic family. In Chicago, our family is a member of St Peter's Episcopal Church, in a 108-year-old limestone building at Belmont and Broadway streets on the north side. Thanks for your website and we wish you the best of times. Just surfing a few of the web sites via the CWDA page. A very well put together site. Good information, very fast to load, even on my 56k dial up connection, easy on the eye, good quality photographs and excellent navigation. Hi. Ccongratulations on a nice site. 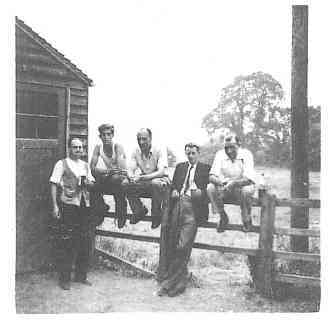 I was tracing my heritage leading to Barford, found the photos great, keep up the good work. Excellent site. Every village should have one! Just browsing the web, tracing my heritage and came across your very nicely put together site. Very clear and informative, keep it up. By the way, does the village name constitute an infringement of copyright?..........thought not. I would just like to say that the website is good. As a teenager who lives in the village I feel it's good to see whats happening.Anyway lots of good information. Loved using the web site and enjoyed browsing. Loads of information. Congratulations will use the site often.